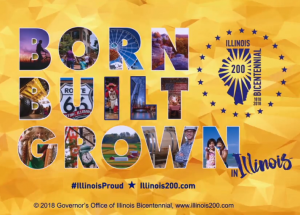 The Illinois Bicentennial Commission today released its first video commercial promoting the state’s 200th birthday. 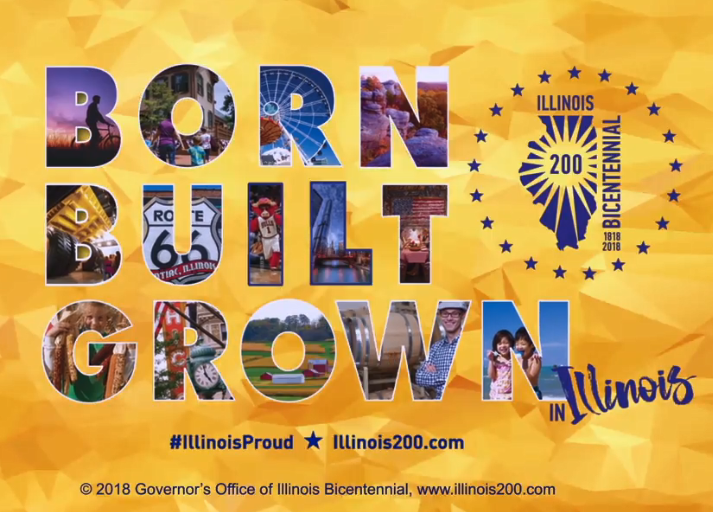 The :30 second spot is the center point of a statewide multimedia campaign named after the theme of the yearlong celebration: BORN, BUILT & GROWN in Illinois. The campaign, which will run from now until the 200th birthday party on December 3, 2018, will showcase Illinois’ influence on the worlds of music, sports, agriculture, literature, commerce, history, technology and innovation, transportation, art and architecture, among others. The content for the effort is pre-produced and being distributed statewide for carriage on television, radio, digital and social media. The messages can be run as public service announcements by media outlets or packaged by outlets for sponsorship by local advertisers. The Illinois Broadcasters Association is the distributor. “We’re delighted with this creativity and the opportunity it now provides our association’s members in seeking local sponsorships,” remarked Dennis Lyle, president and CEO, Illinois Broadcasters Association. The content was produced by Chicago-based AnswersMedia and paid for with private funds. The Bicentennial program incorporates material supplied by Abraham Lincoln Presidential Library and Museum, Illinois Association of Museums, Illinois Department of Agriculture, and the Illinois State Museum.